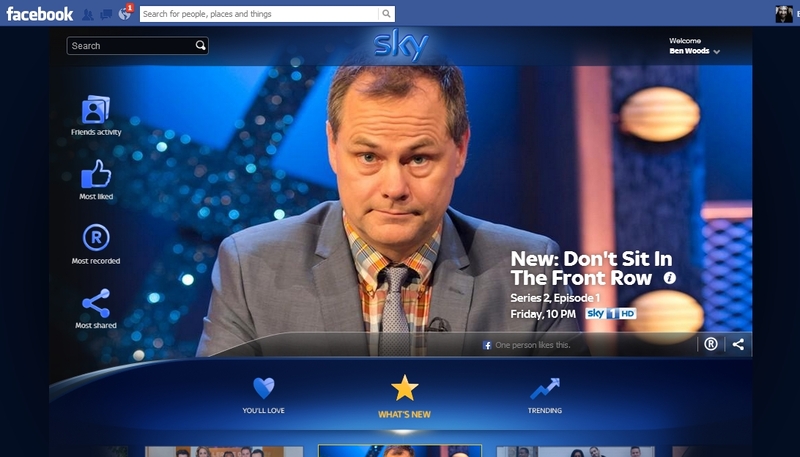 UK television broadcaster BSkyB, more often known simply as Sky, has launched a new Facebook app called Sky Share that provides users with recommendations of what to watch and also allows Sky+ customers to set their DVRs to record. The company released the Facebook app today, promising that it would make your TV viewing all the more social by plugging you into what your friends are watching. It is, however, restricted to only include content from Sky 1, Sky Atlantic, Sky Living and Sky Arts. Connecting the Sky Share app is as simple as logging-in to Facebook and granting it the requisite permissions, although you don’t have to authorize it to post publicly on your behalf in order to use it. Once in, you’re presented with a selection of programmes airing over the next seven days, with options to sort programmes down the left-hand side. Those links allow you to see your friends’ activity (a blank screen in my testing, given it has just been released), most liked, most recorded and most shared shows. There’s also a search box, but results are only returned for shows in the Sky Share app, and not the TV schedule as a whole. So if it’s not on in the next seven days and not in the app, then it won’t return any results. 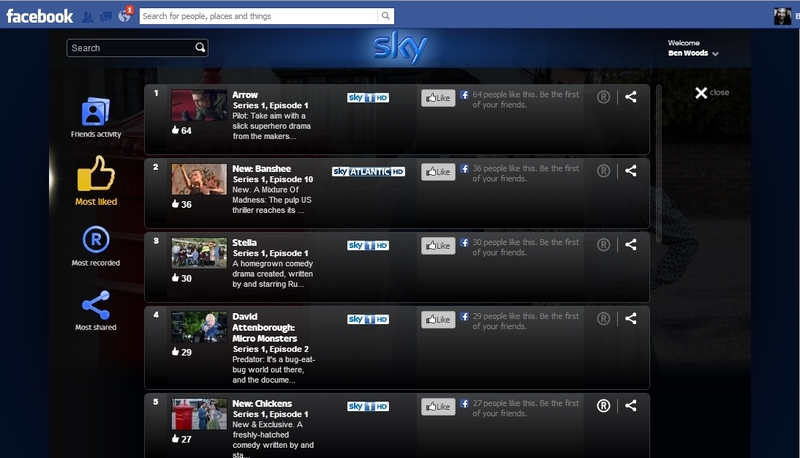 The ‘Most Liked’ shows are shown in the image above and clicking through will take you to more info about that show. If available, it’ll also show preview snippets of upcoming shows, such as ‘A Touch of Cloth II’ below. Comments from Facebook members about the show appear in a box on right-hand side of the app. As it’s name implies, Sky Share allows you to post details of the show to either your Facebook timeline or Twitter stream (or send it to a friend via Facebook message/email) from pretty much every page within the app. 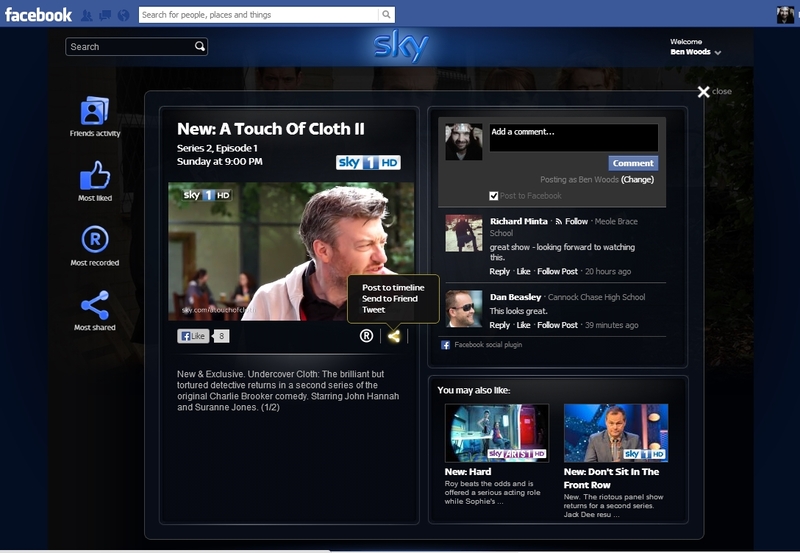 From the main screen, you can select to sort shows by ‘What’s New’, what’s ‘Trending’ and by what ‘You’ll Love’. The latter is a recommendations service. Simply fill out a few check boxes to indicate what you like to watch most and it promises to suggest shows you’ll love. In my testing, the results were a little disappointing. It definitely suggested more documentaries about the Bee Gees than were strictly necessary, or desirable. Still, it’s not choosing from the whole TV schedule, just seven days of listings from Sky’s own channels. 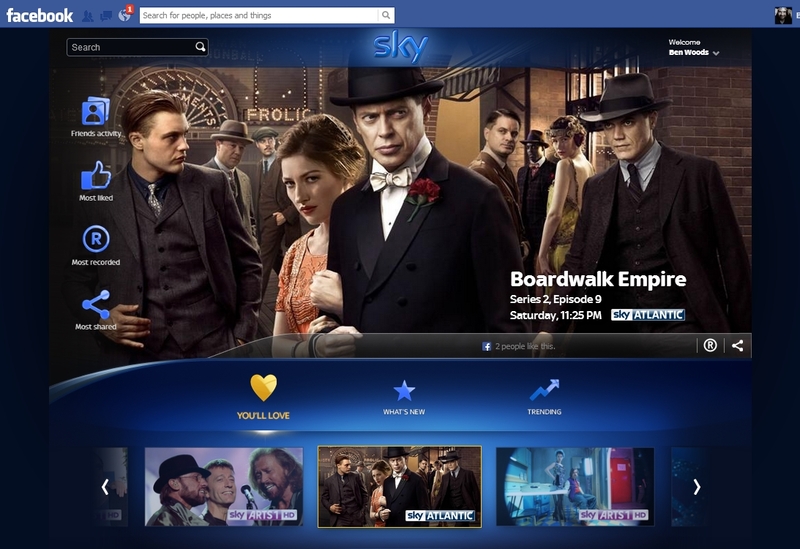 Perhaps the most important feature for Sky+ customers, however, is the ability to set programmes to record directly from within the Sky Share app. As a non-Sky subscriber, it wasn’t an option of much use to me. Like the sharing feature though, it was available directly on most pages. While the app as a whole is open to anyone, it’s only of any real use to Sky subscribers as a result of its channel selection. If you are a Sky customer however, it could well work out a handy way of never forgetting to set your Sky+ box to record again.